A stainless steel 5 gallon water jug is the best option for water storage on camping trips because it's easy to fill, move, and store. Water tastes better when properly stored in stainless steel containers. I never liked the after taste from plastic water jugs. Even my coffee cups are stainless steel. 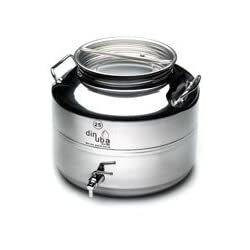 We use our Dinuba stainless steel water jug as a reservoir and water dispenser to fill up our personal water bottles. Saves a lot of money as we don't buy bottled water on our camping trips. Dump the plastic for your drinking water if you want to eliminate exposure to harmful toxins leaching from plastic. Space is a major concern and most high quality stainless steel water containers fit snugly in vehicle trunks and cargo storage areas. Amazon carries several Italian made stainless steel water dispensers that are just as high quality as Dinuba for less money. Most comes with a stainless steel spigot. I really like retro European stainless steel water dispensers. They remind me of the old fashioned milk storage containers. I own the 25 liter Dinuba for over 5 years. We use it for camping and home. The water seems to taste colder. This stainless steel water dispenser holds approximately 4 gallons of water. It's perfect for any room in the house, vehicle, our outdoor patio. I own this model and love it. It holds more than 6.5 gallons of water. It has a decorative look, travels well, and will out live you. Stainless steel water jugs are made to last over a century. They are virtually puncture proof too. They look good in the home on a decorative stand or sitting on your counter top. When we are on one of our long camping trips, 5 gallons of water will last us approximately 4 days for all of our cooking and drinking needs Water is heavy weighing in at approximately 1 pound per pint of water. A 5 gallon water jug filled completely filled will weigh a little over 40 pounds. This is about my limit for what I like to lift in and out of the back our camping vehicle. We purchased the 25 liter Dinuba stainless steel water dispenser from Amazon and it rocks! My wife told me about the stainless steel Big Berkey gravity water filtration system that pays for itself within a year when used as your primary water source. We were spending about $10 week on on filtered watered when factoring in the fuel to pick up water 1-2 per week. We ordered a 2.5 gallon Big Berkey Stainless carbon black water filtration system from Get Berkey several years ago and will not go back to filling up our stainless steel water jugs on a regular basis. Our Dinuba may now be used for additional water storage. Forget buying expensive disposable filters as Black Berkey purification elements can be cleaned with a piece of green Scotch Brite. Each durable and efficient purification element will last for up to 3,000 gallons What's more, the unique Black Berkey purification elements are self-sterilizing. After your first year, each gallon of water will cost about 2 cents per gallon based on replacing your filters every 3000 gallons. Whether it's 2 cents or 10 cents makes no difference as I buy Berkey for the quality and convenience of fresh water delivered to my cup daily. For years, our classic stand by has been a 5 gallon plastic BPA free water jug. We are concerned with toxins leaching into the water. BPA is the 3 letter abbreviation for "Bisphenol A". Some of potential biological side effects have included developmental toxicity, carcinogenic effects, and possible neurotoxicity. The best advice for avoiding any nasty chemicals is to go with a stainless steel 5 gallon water jug. While stainless steel 5 gallon water jugs cost more up front, they last for years. Stainless steel water containers do not have that fowl plastic taste that becomes evident after 2-3 days in a plastic water bottle. I use a 5 gallon plastic water dispenser jug for general washing. No sense buying a $200 stainless steel container for bathing and washing dishes. A good quality 5 gallon water jug cooler will have a controllable spigot for ease of use. The spigot on the water jug is great for washing and rinsing dishes too. We use the spigot to wash and rinse our hair as well give sponge baths when showers are not available. For those of you with concerns about space, a 2.5 gallon water jug is perfect for tight-fitting vehicles. Coleman 5 gallon water jugs are by far the most popular anywhere. We drink water all day. It's important to buy a water jug that is built well and easy to use. Click on the 5 gallon water jug below to view several options available for sale. Having the right camping equipment checklist will ensure that you pack everything for your trip including the best 5 gallon BPA free water containers. 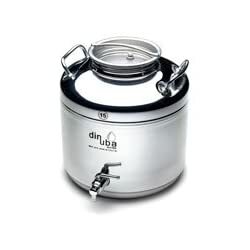 Poor quality stainless steel has now caused my second dinuba 15 liter to rust on the inside. As an added bonus the newer push button dispenser valve on the second jug is leaking around the outside and the nut holding the vent is corroding. It looks like a chrome plated nut and not stainless steel. The first one also was rusting at the weld joint on the inside. For such a high price they should not cut corners on the materials. Would not recommend dinuba. Premium price was not worth it. I now have search for another source because two rusting jugs tells me they are not a quality vendor.